The CONTERNA is a continuous operation multi-chamber kneading machine patented throughout the world. The standard version comprises 6 horizontal chambers arranged in series, each powered by a frequency controlled AC motor. All 6 chambers are arranged together in a block. Liquid and solid components can be introduced into the top of each chamber (except the final one). 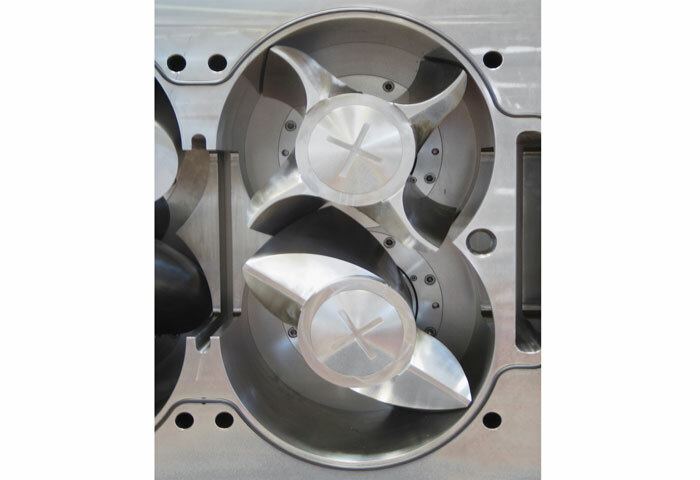 The product is discharged from the 6th chamber via a discharge nozzle or a gear pump connected by a flange, depending on the material and viscosity. The top and bottom of the chamber block each have an independent temperature control jacket. 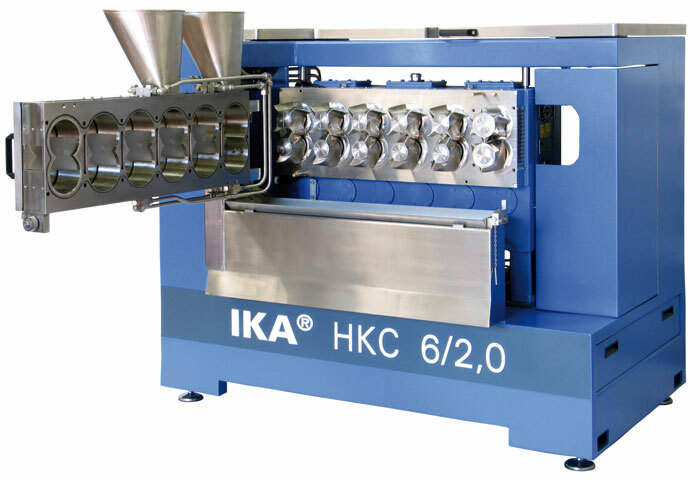 The CONTERNA kneading machine is constructed as a modular system, i.e. both the number of kneading chambers as well as the design of the kneading tools and discharge module can be varied depending on the application and desired results. 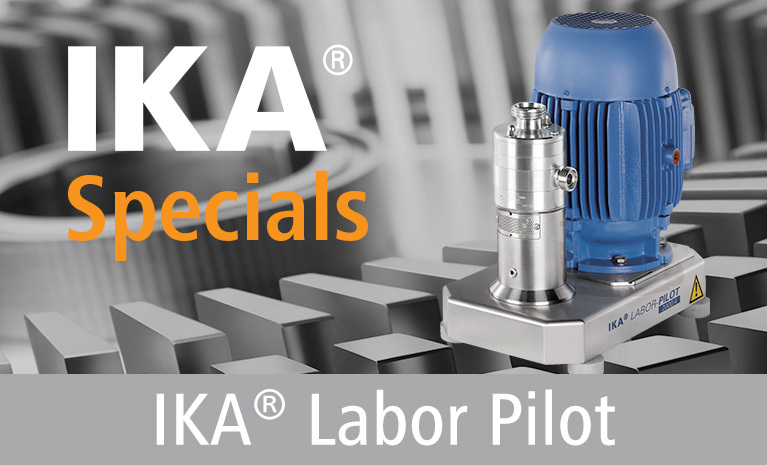 This allows the kneading intensity and product residence time in the machine to be adjusted individually to each application. 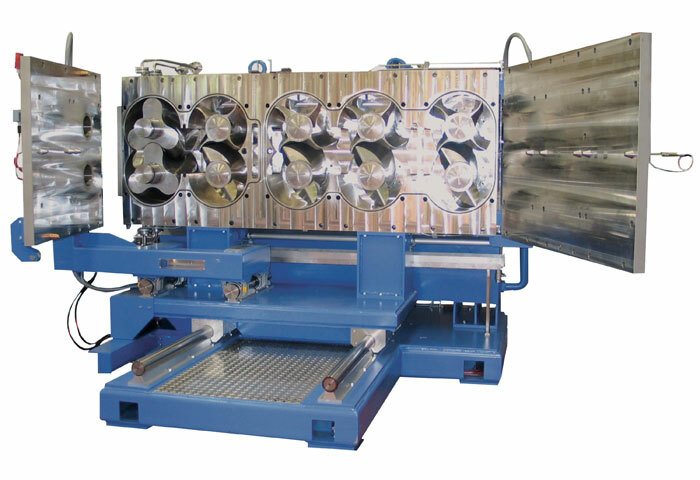 Variants on the standard 6-chamber machine have already been constructed with 4, 5, 8 and 12 chambers, in each case to meet the requirements of the product to be processed. The arrangement of a number of chambers in series enables continuous mixing. 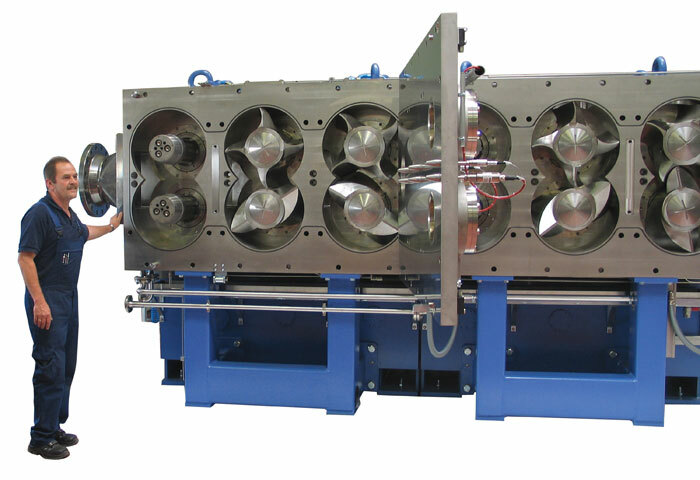 Each processing chamber has 2 DUPLEX-type kneading elements arranged one above the other and with infinitely variable speed adjustment via the motor. The liquid or solid component to be introduced is continuously conveyed from chamber to chamber by the kneading elements before being discharged from the last chamber. Whereas in conventional extrusion processes the product residence time is only relatively short and thus only a limited energy input is possible, the CONTERNA continuous, multi-chamber kneading system offers a wide range of residence times, which can be set as required. The continuous conveyance of the product from one chamber to the next ensures intensive, but gentle and uniform substance mixing. In addition, significantly higher solids contents can be achieved than with conventional extruders. The CONTERNA concept allows a number of process steps to be combined in one machine, such as the mixing, kneading, rolling and extrusion of medium to high viscosity media. Continuous processes have considerable advantages over batch processes – provided that the process parameters allow it. The kneading chamber cover is removable to allow cleaning and maintenance of the machine. The complete kneading chamber block can be opened hydraulically, providing easy access to the kneading chambers and kneading blades. The kneading machine is operated by a touch screen operator terminal with graphics capabilities (HMI) incorporated into the switchboard panel.